Jeremy doesn't want a manufacturing job. Not much to tweet about yet. 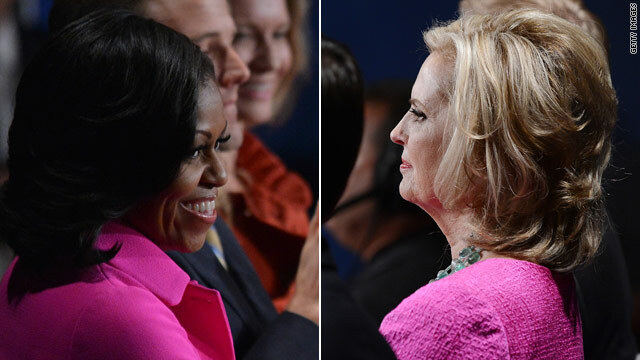 Many of you point out maybe @MichelleObama + @AnnDRomney are wearing pink for breast cancer awareness month... womens vote hangs in balance. Both candidates walked toward the first questioner tonight as they gave their answers, a strategy that signals empathy, according to body language experts. Bill Clinton became known for the move when he approached a voter during a 1992 debate against then-President George H.W. Bush. Obama reminds Romney he stood in front of a coal plant and said "This plant kills.. and now you're suddenly a coal plant." FACT: Romney’s only solution to lower gas prices is to drill for more oil—yet he opposes vehicle standards that will save money at the pump. At a time when America has a jobs crisis, wouldn’t it be nice to have a job creator in the White House? @MittRomney is ready to lead. Jeremy is tonight's Big Bird. Town hall debates are genteel affairs. Oh wait. Romney should explain himself more and attack O less. If ppl conclude his policies will grow the economy, he'll win. "@LaurenYoung: I want more Long Island. "//ohmygawd, me too! #longislandnative! "Cutting out the middle man" on student loans meant a government takeover of the college loan industry. RT @ArianFoster: I'm voting for candy ... @CrowleyCNN does rule. Romney on pay equity for women... talks about how he sought out women for his cabinet in Massachusetts. Staff brought "binders"
Where are YOU watching CNN? Take a picture and send it in. And if you want to cut your own clips from this debate, in real time, go to CNN.com/Debates. Curious which candidate has spoken more? Approximately halfway through this debate, Obama at 19:44 and Romney at 17:00. Next question goes to Romney. Free birth control for women. Yes - let the gvt decide these things...and make the private sector give things out for "free". Right now this is a draw. Most town halls usually are. Agreed > RT @AriFleischer Right now this is a draw. Most town halls usually are.